So here we go: we just reached 3 million residents and nearly 30k concurrent users. Additionally over 1 milllion people have been logged in over the last 60 days. UPDATE: Residents got afraid of the high numbers just before 30k was hit and backed out so that concurrency is now back to 28k. 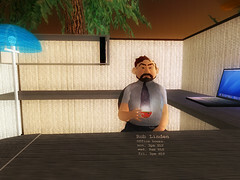 Rob Linden is the person responsible for the community management for the Second Life Viewer Open Source project. His background is in Open Source and business as he was working for 9 years at Real Networks in the open source department. He thus knows all the licensing issues quite well. He now is working on setting up several processes to integrate the Open Source community more with Linden Lab. He also opened an office (a cubicle in the forest in Grasmere) and is regularly holding office hours there. So if you have questions about the Open Source viewer (be it technical or any other issue) feel free to visit him there. His hours are monday 3pm, wednesday 9am (if the grid is up) and friday 3pm. Read more about him here. Additionally he is posting on the SLDEV mailing list (which is dedicated to the Open Source viewer) and he’s also often to be found on IRC on the #opensl channel on EfNet (irc.efnet.com). From my point of view all this looks very good from Linden Lab‘s side and it makes clear that their Open Source effort are serious and they are contributing as much as they can (although in some fields there are still some limits in terms of practicability, legal issues and so on). Being pleased about the fact of opensourcing the client we can also be pleased about the fact of the support Linden Lab gives the developer community. I also hope that many of you developers will come and share your thougths about the source code, it’s possibilities and it’s problems. Non-developers might be able to discuss their thoughts and eventually fears, too. 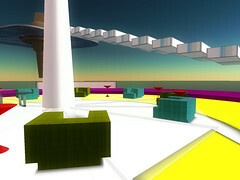 The party will be held on the Theta sim, just in the middle above the sandbox. As I reported earlier, Linden Lab is considering giving out bounties for features they want to see implemented. While Linden Lab has not yet a bounty to offer Adam Zaius now took the step to introduce community bounties for features people from the community would like to see implemented. As he seems to have problem compiling it with his version of MSVC he gave out a bounty for writing a howto about it. Now it might be interesting to see if other people will follow and give out their bounties (e.g. virtual service companies) and to see how Linden Lab reacts and eventually adds money to given bounties or eventually even rejects them for inclusion in the official client (the howto is of course sort of a different thing here). So these might be the first sign of the creation of a community around the source code. More will follow, I am sure. 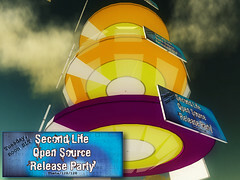 If you are having a virtual service company you might be happy about the release of the source code of the Second Life client as it opens up a lot of possibilities. You might be able now to add the features you need for your clients yourself and do not have to lobby Linden Lab to do it. This is cool. But beware. If you implement a feature it still has to make it into the official client to be available for the majority of Second Life users. If you have clients whose users are willing to download your own custom version of your client it will work but also think of the need to update it regarding grid changes. Also think of users coming with the official client and thus not be able to use all the features possible in your build. There need to be sensible defaults for them. And think of quality assurance (QA) which you also would need to do yourself (although I expect this more critical for sim code changes). So it’s unfortunately still not that easy to enhance the experience as you want as for the official client it still needs to go through Linden Lab’s development and QA process. And then again for the masses an open source client also means that many vulnerabilities might be found which might mean a lot of updates in the near future. Yes, you read right. Expectations were that it would happen a lot later this year but the year is only 8 days old and Linden Lab released the source code for their client today! It was mentioned a lot of times (and last time I heard it was at the SLDEVU in London whicih was in December last year but even then it sounded as if it would be like August 07) but now it finally appears! This is a big step for Linden Lab and surely also one for the community. And especially it isn’t really an embrassing license under which it’s released (as Tateru was guessing), probably meaning that it might be some self-constructed OSS like license. In fact it is GPL v2. Of course every license has it’s issues but this one is a well known and well understood license also used by Linux and many other big projects (including Java nowadays). Actually I am wondering how the organisation of development efforts will be managed. Apparently it won’t work if everybody starts to code something. This whole organisational process is usually one of the more complicated topics of open sourcing a product which has not grown up like that. The other question is also in what state the code is (unfortunately the link is not working right now and I haven’t looked at the code yet). For Mozilla it meant that people spent more or less rewriting everything from scratch, for Second Life the code quality is also supposed to be quite “grown” which means that it might not as clear and modular as you’d like it to be. We will have to see. I expect lots of discussion and lots of work in front of Linden Lab to make it really work but the fact itself is a historic one. Update 3: Because of this event there will be another technical townhall meeting with Cory Linden tomorrow from 3-4pm at the Pooley Stage.